This are artifacts from one of the common MSA surface scatters at Ubari (Libya). 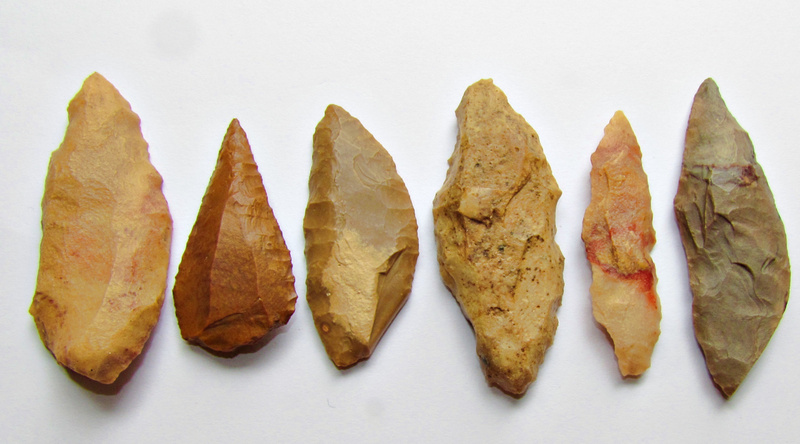 From Left to Right: elongated unifacial MSA point, fine "Mousterian" point with facetted base presumably Levallois, one unifacial scraper also shown in Fig.2, two small bifacial foliates not larger than 6,5 cm, last but not least: a bifacial bi-pointe, also seen in Fig.3). Ubari is an oasis is situated between the Messak Sattafat plateau and Idhan Ubari erg sand dunes and lakes. Today Ubari is located in one of the driest areas in the world. It has a hot desert climate with short, very warm winters but long, extremely hot summers. Average annual rainfall is one of the lowest found on the planet with only 8 mm and many decades may easily pass without seeing any rainfall at all. As early as in 1857, Heinrich Barth, one of the first systematic European "explorers" of Africa noted petroglyphs in the Erg Murzuk and discussed them in the context of past climate change, oscillating between dry and humid phases. It became subsequently clear that the Sahara saw several significant Humid Phases during the Pleistocene and the Holocene. Recent research showed that perennial lakes, interconnected with water bearing paleo-rivers were abundant in the Sahara during these African Humid Periods (AHP). They are contested from the early Holocene and from the Middle Pleistocene. This hold true for MIS5e at 130-120 k.a. One event is dated around 170 k.a. and another at 330 k.a. Even during drier times there were certainly many econiches where animals and Homo sp. could survive. One example is the MIS4 (TL and OSL) occupation at Uan Afuda and Uan Tabu (Lybia, MSA / Aterian). The artifacts shown here were found at Edeyen Ubari more than 40 yrs. ago and represent parts of one discrete surface cluster. Fieldwork in the Ubari sand sea during the last years has identified a “Mode 1 Industry” which could be very old (ca 1 Mio years), but these surface scatter could not be dated till now. Small clusters of Acheulian were also detected (Cancellieri and di Lernia 2013, Foley et al. 2013). 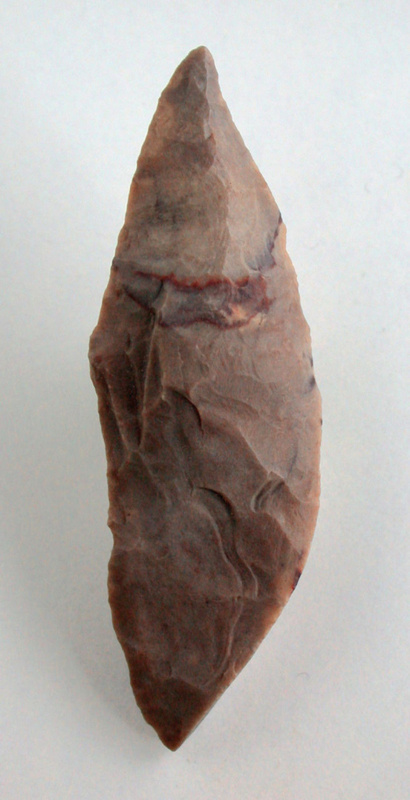 The Acheulean shows a hypothetical early phase followed by a phase characterized by Large Cutting Tools (LCTs) made by the Tabelbala-Tachengit technique, and a “final Acheulean” with flat symmetrical handaxes and artifacts made by different Levallois techniques). The rich regional MSA is currently undated. Different Levallois methods and the production of large blades were observed during surveys of International Teams working at the boundaries of the Ubari Sand Sea (also known as Edeyen Ubari). Tanged pieces are common at some clusters and bifacial foliates may indicate some Lupemban and Sangoan influence. Anyhow the diversity of the local MSA goes beyond the MSA / Aterian dichotomy. Use the first external Link for impressions made by Ursula in the region!